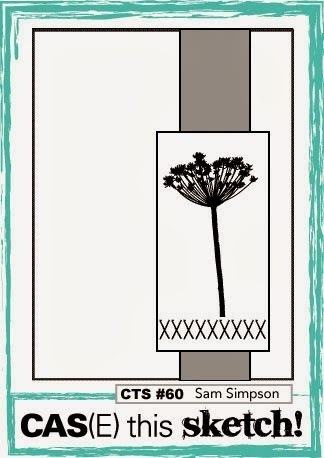 Stampin' Up ideas and supplies from Vicky at Crafting Clare's Paper Moments: In love with Banner Blast! In love with Banner Blast! This is about as layered as I ever get with my cards but there's lots of clear space so it still feels quite clean and simple - but have you spotted those fabulous banners?! 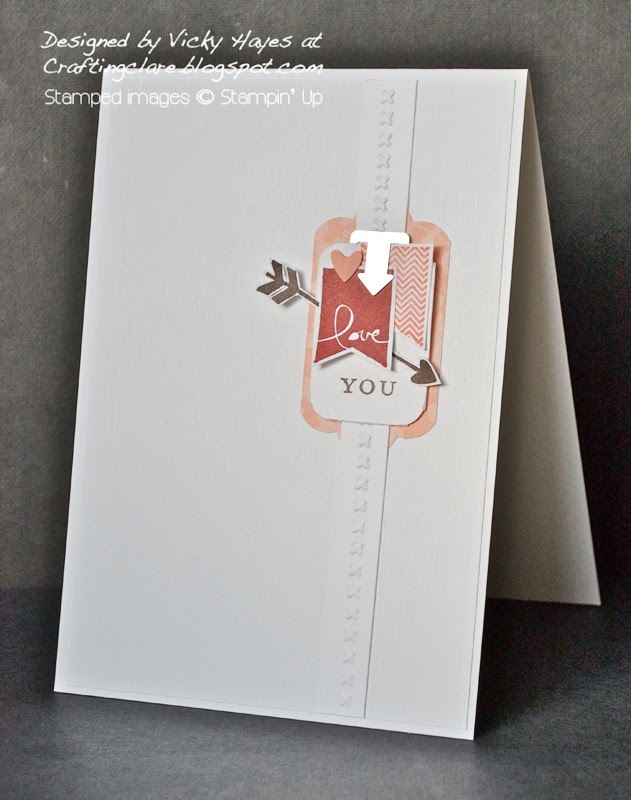 I stamped the word 'you' onto a tiny panel and clipped my stamped banners onto it with one of the Essentials Hardware clips, adding a stamped and cut-out arrow and a punched heart to embellish. This was placed onto a background cut out of one the Sale-a-bration designer papers using a fabulous new punch. These tag topper punches are designed to make tags quickly and easily but there's SO much more you can do with them! I've whipped the topper away in this photo so you can see that I punched the tag top on both the top and the bottom of this piece of designer paper. The strip the background is mounted on is actually threaded through the tag too - just think of the possibilities! The strip is embossed using the Needlepoint Border embossing folders and layed onto core'dinations card stock which provides a nice contrast with the smooth card base. This week's fabulous sketch from CAS(E) this sketch inspired my card so I'll be linking this card up over there. My sister and her family came to visit us this weekend and my daughter, who plans to do English and French at university, was able to chat to her aunt who studied those subjects herself. They discussed idioms (such as 'it's raining cats and dogs' in English) and my daughter explained that you get extra marks for using French ones in the exam and could my sister could think of any? My sister thought for a moment and then came out with 'Il y a du monde au balcon (there are lots of people on the balcony)' which turned out to mean a woman amply endowed in the bosom area! Yes, thanks Sis - very helpful for my daughter's A level! Oh you are teasing us! Perhaps your daughter would be better to "Garder la tete Froide" and not use her Aunt's suggestion in the exam! Lovely card Vicky. I have 2 bilingual adolescent boys in the house, I'm sure they could come up with some more idioms but maybe they wouldn't help with A-levels either!!!!!!!!!! Love this..... Really modern.... I feel an order coming on.. Stunning card Vicky, love the colours. As for French I always wanted to study it, never got around to doing anything about it, maybe it's something I should start thinking about now! What are you lot like seems that teasing nature runs in the family. I love, love , love this card Vicky you should layer more often you really do everything so well.